The countless variations of textile sensors Hannah Perner-Wilson aka Plusea created provide a valuable toolbox and source of inspiration for the eTextile community. 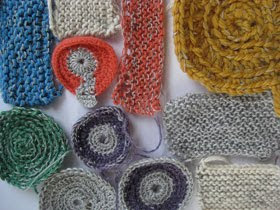 Her recent focus on pressure and stretch/bend sensors made by knitting and crocheting offer a unique alternative to conductive stretch fabric sensors. Although it is sometimes challenging to find conductive yarn and wool in smaller quantities for DIY projects it is easier than finding stretchable conductive fabric for the use as bend/pressure sensor in eTextile projects. Another advantage of knitting or crocheting is the form/shape freedom one has. Any shape imaginable can be knitted or crocheted or made of a combination of both. Rather then pointing out one of the many recent DIY knitted and crocheted sensor projects Hannah made.